The Horrible Dr. Hichcock (sic!) 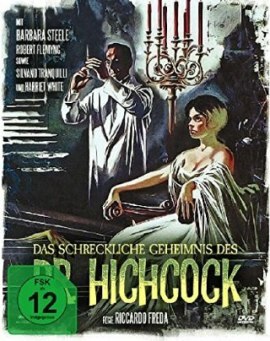 (Original: L'Orribile segreto del Dr. Hichcock, 1962) is an Italian horror film starring Barbara Steele. The German distributor Ostalgica releases its uncut long version in HD. This marks the first time the film is offered in high definition anywhere. Apart from a limited DVD (600 pieces), there will also be a Blu-ray/DVD combo with a soundtrack CD and a booklet, limited to 1000. The release is scheduled for February 16th, 2018.